Greasy Creek is the most densely populated of the Council’s “Model Watersheds”, which have been our primary restoration focus since 2009. It is a relatively large subbasin, bisected by Highway 34. The western tributaries flow from the flanks of Marys Peak, and include the source of a third of Corvallis’ drinking water — Rock Creek. Managed by the Siuslaw National Forest, the headwaters serve as a great example of high-functioning forest streams. 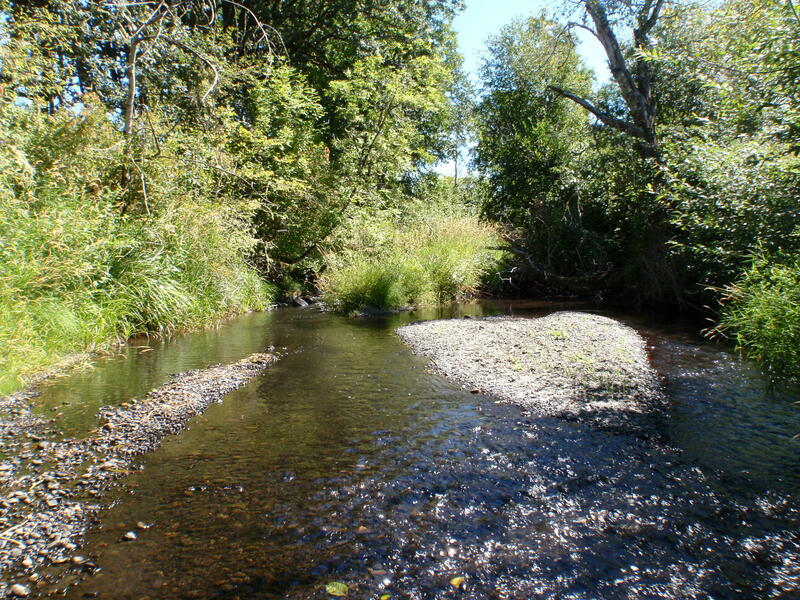 Restoration within the Greasy Creek sub basin started in 2008 on Rock Creek in partnership with the City of Corvallis, addressing fish passage at road crossings and intake structures and adding large wood to the stream. A Rapid Bio-Assessment (RBA) conducted in 2010, identified a series of “anchor” habitats in Greasy Creek and its tributaries, where habitats have the potential to sustain all life history stages of salmonids. Greasy Cr Rapid BioAssessment 2010 Greasy Creek is rich in gravels and in summer pool habitat. However, a lack of woody debris limits the accumulation and sorting of gravels to fully support spawning habitat. Warm stream temperatures in lower Greasy Creek limits the capacity of the abundant summer pools to support salmonids to their full potential. A neighborhood meeting to discuss the RBA findings initiated a series of partnerships with private landowners to address limitations in both the tributaries and main stem of Greasy Creek. Twenty-six landowners have voluntarily participated with the Watershed Council in planning and implementing restoration projects on their stretch of Greasy Creek or its tributaries. To date, this has included removing fish passage barriers, adding large wood, controlling Japanese knotweed, building livestock exclusion fencing and planting riparian vegetation. All but one landowner on Greasy Creek has cooperated with the survey and treatment of Japanese knotweed.